Brandon Waddell does not have any MLB stats for the season. Draft: 2015, Pittsburgh Pirates, 5th rd. 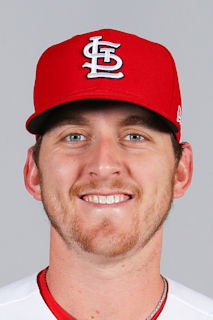 January 5, 2019 Pittsburgh Pirates invited non-roster LHP Brandon Waddell to spring training. September 1, 2018 LHP Brandon Waddell assigned to Indianapolis Indians from GCL Pirates. August 28, 2018 LHP Brandon Waddell assigned to GCL Pirates from Indianapolis Indians. May 30, 2018 LHP Brandon Waddell assigned to Indianapolis Indians from Altoona Curve. August 21, 2017 Altoona Curve activated LHP Brandon Waddell from the 7-day disabled list. July 19, 2017 Altoona Curve sent LHP Brandon Waddell on a rehab assignment to West Virginia Black Bears. July 15, 2017 Altoona Curve sent LHP Brandon Waddell on a rehab assignment to GCL Pirates. June 8, 2017 Altoona Curve placed LHP Brandon Waddell on the 7-day disabled list retroactive to June 6, 2017. Left forearm strain. May 4, 2017 Altoona Curve activated LHP Brandon Waddell from the 7-day disabled list. April 18, 2017 Altoona Curve placed LHP Brandon Waddell on the 7-day disabled list retroactive to April 14, 2017. Left forearm strain. May 3, 2016 LHP Brandon Waddell assigned to Altoona Curve from Bradenton Marauders. April 5, 2016 LHP Brandon Waddell assigned to Bradenton Marauders from West Virginia Black Bears. July 16, 2015 Pittsburgh Pirates signed LHP Brandon Waddell. July 16, 2015 LHP Brandon Waddell assigned to West Virginia Black Bears.